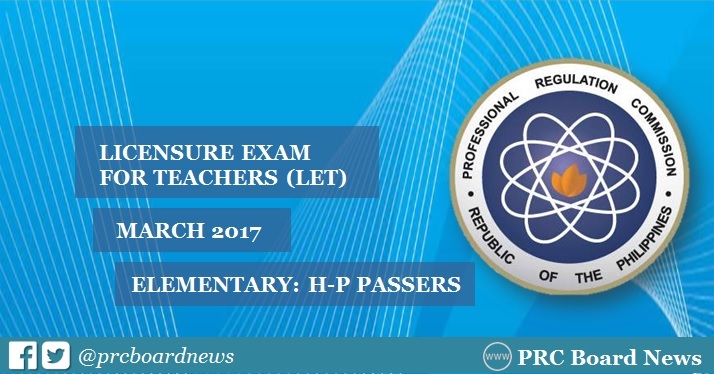 The Professional Regulation Commission (PRC) and the Board of Professional Teachers (BPT) officially announced the alphabetical list of passers for Elementary Level for March 26, 2017 Licensure Examination for Teachers (LET) or Teachers board exam. The recent LET was conducted in at least 18 testing centers nationwide which include Bacolod, Baguio, Cagayan de Oro, Catarman (Northern Samar), Cebu, Davao, General Santos, Iloilo, Legazpi, Lucena, Manila, Puerto Princesa (Palawan), Rosales (Pangasinan), San Jose (Occidental Mindoro), Tacloban, Tuguegarao, Pagadian and Zamboanga. Those awaiting results may now find on this page the passers with H-P Surnames. The March 2017 licensure examination for teachers is consists of two (2) parts for Elementary: General Education (40%) and Professional Education (60%) and three (3) parts for Secondary: General Education (20%), Professional Education (40%) and Specialization (40%). Aside from the full results, the schedule of registration for the issuance of Professional Identification Card (ID) and Certificate of Registration will be announced. PRC advised passers to personally register and sign in the Roster of Registered Professionals only.